a shower, while they’re pretty wet. I least expect odor to strike, of all places, on my feet, though I’m glad there’s a product that addresses this problem. It’s the Fissan foot deodorant powder. in my bedroom without the odor. For my first case of feet odor adapted from smelly slippers, the fissan foot powder neutralized the odor almost instantly. Whatever’s smelling could be your stinking shoes! Or, the odor is still traveling in the air. I was planning to pour some of the powder on my cute bunny slippers to drive away the smell, but it was too much to bear. There was nothing I could do to salvage the pair. The powder must cover every corner of your little toes to ensure the odor is alleviated. I liken its texture to baking soda. It leaves the feet looking ashen. It is quite powdery because of the talc in it, so pour the powder close to the skin as possible to prevent inhaling the talc. skin from sweating is a dubious claim, because it’s not an antiperspirant. The powder’s main deodorant formula consists mainly of zinc oxide and other agents that act upon the odor by killing bacteria/ fungi. The scent attempts to smell pleasant, but you can detect a medicinal quality owing to the zinc oxide. It’s a relative smell present in some of the topical ointments I’ve used that contain zinc oxide. Although I like the smell of talc baby powder, this one is identifiably a foot powder. Btw, it also has peppermint and menthol which hardly, if any, produce any tactile sensation. 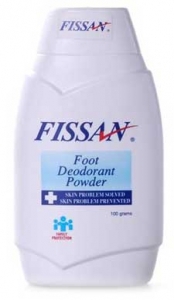 The crux of this review is that the Fissan foot powder is effective for foot odor, as it did for me. It retails at 2 dollars. Now I’ll be careful never to wear fuzzy bunny slippers no matter how cute. I haven’t really tried this one but I have used another brand for a similar purpose. From your review though I just miht stick to what I am already using. Thank you so much.